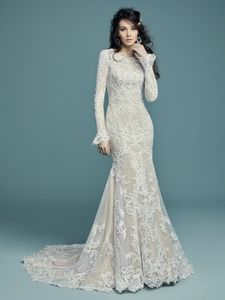 Description: Lace motifs cascade over netting and tulle in this unique fit-and-flare modest wedding gown. Featuring a crew neckline, subtle V-back and long sleeves accented in bell cuffs. Lined with shapewear for a flattering fit, and zipper closure. Detachable tulle overskirt accented with an attached beaded belt sold separately.